Two men; two personalities; two slants of love; one destiny. Roy’s tender heart is on a quest to find the holy grail of mankind true love. But, the soft echo of feisty Monica’s whispering words remember, remember, the sixth of September will change everything, raining mayhem on him and everyone he touches. Shammi, a serial monogamist, thinks love is an urban myth a ridiculous creation of the feeble hearts. As awe-inspiring beautiful Sona brisks through his life, the sublime aura of her love brews a raging battle within him. A battle between his objectivity and his heart. Smothered by the haunting shadows of the causality of love, Shammi’s life spirals down a path of retribution against his own demons and Roy’s life is sunk in a deluge of inexplicable state of affairs. Facing imminent danger and running out of options, Roy suddenly finds himself cornered and isolated. Roy’s only glimmer of hope is by helping Shammi pull out of the dark tunnels of his inner demons; transforming his retribution into redemption; healing his agony with hope; and swapping his wretchedness with swagger … the swagger of love. 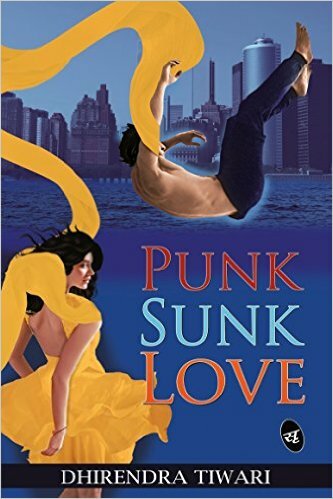 REVIEW- "Punk Sunk Love" is romantic fiction written by Dhirendra Tiwari where author serves us story of Roy and Shammi how their paths crosses with each other with smooth touch of love. I received this book from Arudha in exchange of an honest and unbiased review. Book Title and Cover- Book Title seemed odd at first but as story continued it seemed appropriate with the content. However it could be improved. Cover is beautiful and catches attention of readers. Blurb is short, interesting and upto mark. Language and Writing Style- Language used in our book is easy to comprehend. Writing style of Mr. Tiwari is easy to follow . Story flows effortlessly with decent pace. Characterization- All the characters are defined well with their goods and bad and so are relatable. Storyline and Plot- Storyline is intriguing with the suspense factor. All the scenes are portrayed well. However over description of little unwanted things was turn off for me. Except this, both the plot and storyline are intriguing. Overall Punk Sunk Love is average read and can be enjoyed by romantic fiction lovers.